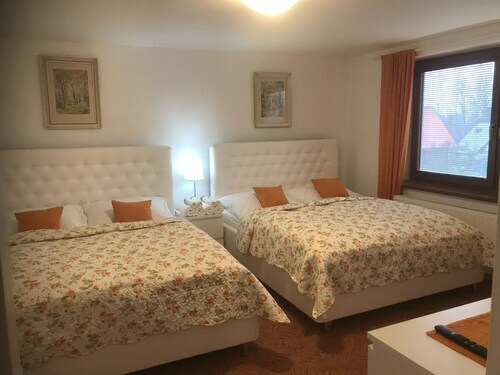 Situated in Frydlant nad Ostravici, this apartment building is 2.1 mi (3.3 km) from Malenovice Ski Area and within 12 mi (20 km) of Aquacentrum Olesna and Hukvaldy Castle. Tatra Technical Museum and Lysa hora are also within 20 mi (32 km). Frydlant nad Ostravici Station is 23 minutes by foot. Situated in the mountains, this pension is within 6 mi (10 km) of Church of St. Jan Nepomuckeho, Malenovice Ski Area, and Prosper Golf Club. Monkey Rope Centre and Svoboda Square are also within 9 mi (15 km). Frydlant nad Ostravici Station is only a 2-minute walk. Situated in Frydlant nad Ostravici, this vacation home is 2.4 mi (3.8 km) from Malenovice Ski Area and within 6 mi (10 km) of Church of St. Jan Nepomuckeho and Prosper Golf Club. Monkey Rope Centre and Church of St. John and St. Paul are also within 9 mi (15 km). Frydlant nad Ostravici Station is 19 minutes by foot. Located in Ostrava City Centre, this hotel is within a 15-minute walk of New City Hall Viewing Tower, Fairgrounds Černá Louka, and Vodni Svet. Ostrava Zoo and Landek Park Mining Museum are also within 3 mi (5 km). Ostrava Central Station is 30 minutes by foot. 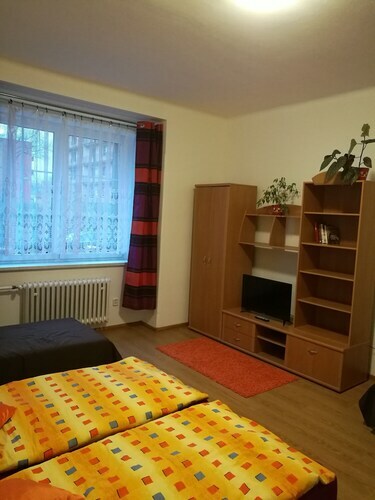 How Much is a Hotel Room in Frydlant nad Ostravici? Hotels in Frydlant nad Ostravici start at $125 per night. Prices and availability subject to change. Additional terms may apply. Are you taking a vacation to Moravian Silesian and looking for a place to stay in or near Frydlant nad Ostravici? Frydlant nad Ostravici offers 5 hotels and apartments, all within easy driving distance of the town center. Some hotels situated just a short drive from the heart of Frydlant nad Ostravici are the Ondrás and Green Inn Hotel. The Miura Hotel is located 4 miles (6 kilometers) from the middle of Frydlant nad Ostravici. Alternatively, the Hotel Jan Maria is about 17 miles (27 kilometers) away. The Mercure Ostrava Center Hotel and the Afrika Hotel are two other recommended accommodation options worth looking into around Frydlant nad Ostravici. Ostrava is 17 miles (28 kilometers) to the north of Frydlant nad Ostravici and is home to Technical University Ostrava and Vodni Svet. The Imperial Hotel Ostrava and Park Inn by Radisson Ostrava are a few of the Travelocity long and short-stay options in Ostrava. For another option, head to Karlova Studanka, 60 miles (96 kilometers) to the northwest of Frydlant nad Ostravici, where you can choose from the Sporthotel Kurzovní and Horský hotel Kopřivná. When you stay in Karlova Studanka, a couple of sights worth adding to your itinerary are the Karlova Studanka Tourist Information Centre and St. Hubertus Chapel. Prior to saying your goodbyes to Moravian Silesian, ensure you catch some sport. Get to CEZ Arena, found north of Frydlant nad Ostravici. 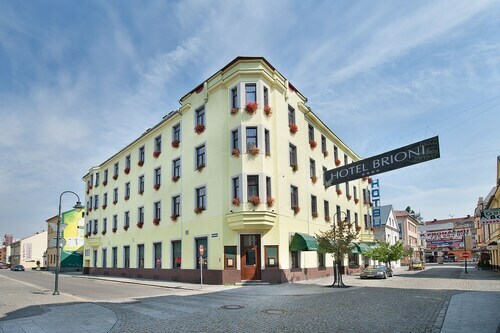 Those wanting to find hotels nearby can compare the Clarion Congress Hotel Ostrava or the Brioni Boutique Hotel. Why not visit Travelocity's informative Frydlant nad Ostravici city guide to unveil the varied scenic attractions this part of the world has in store.